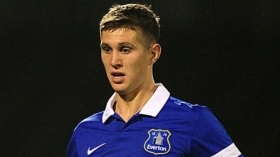 Manchester City are reportedly planning to hold discussions over a new long-term deal with defender John Stones. Manchester City are understood have no plans of offloading John Stones despite being on the fringes of the first-team of late. The England international has made just one appearance since March. With the Premier League title already in their grasp, Manchester City's plans for next season will already be up and running as Pep Guardiola and his team look to dominate English football even more in the coming campaign and attempt to conquer Europe. It is likely that a number of new players will arrive at The Etihad over summer, but that may mean that some have to leave, one of which could be England defender, John Stones. Man City centre back Eliaquim Mangala is likely to leave the Premier League leaders in January. The French defender is on the radar of numerous clubs across Europe, but his former club Porto are favourites to land the defender. Manchester City are reportedly set to go head-to-head with Liverpool in the pursuit of Southampton centre-back Virgil van Dijk. England manager Gareth Southgate has revealed that Phil Jones has not suffered a serious injury during the Three Lions' friendly versus Germany on Friday night.